Young Thug release a bizarre video for his single “Best Friend.” The track is featured on his new mixtape Slime Season due for release in September. The confusing clip saw the Atlanta rapper pouring lean in a cup while dancing in the woods. 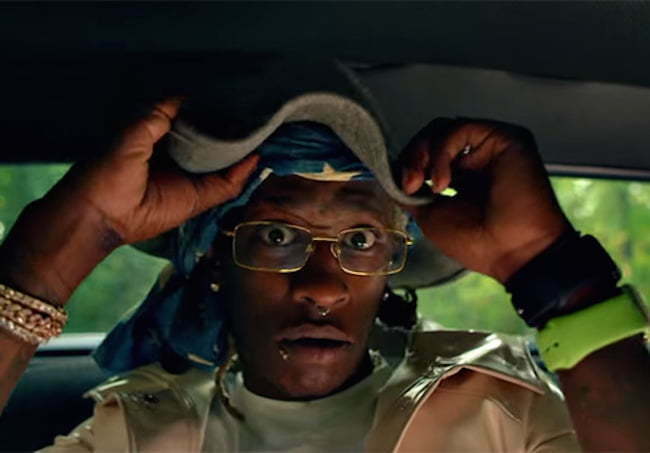 In another scene Thugger is chauffeuring himself while rapping. The rapper basically played multiple versions of himself. Just when you think Young Thug couldn’t get any stranger he just did. During his appearance in Dazed magazine, Thugger spoke about making a song in eight minutes. “I think as I go I can’t remember 16 bars,” he said. “Unless you write it, you can’t. I just do it bar for bar. I did a song in eight minutes. I thought everybody could write songs that fast. But working with a lot of them, they don’t. Wayne and Drake, it takes them so long to do a song. Watch the official music video for Young Thug song “Best Friend” below.